We are heading to Thailand in one week. We just spent 2 days singing for the fine people of Lynden and Bellingham, Washington. We will spend one week working with several schools in Bangkok in preparation for a large choir festival next Friday and Saturday, Oct 7 and 8. M.E.N. will be converging on Puyallup, Washington tomorrow (July 17) to spend a few days in a recording studio. We are going to be recording some of our newer songs for our trip to Thailand in October. Watch for the new CDs at a performance near you, or on iTunes. 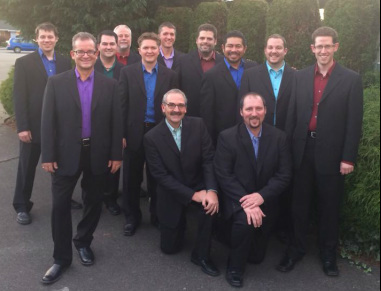 Male Ensemble Northwest is happy to introduce our two new members. A Big THANK YOU to all who auditioned. We very much appreciated meeting you and the time you took to come sing with us! Meet Will and Darren on our "Members" tab. Kneeling, Dan Davison and Jim Taylor. Standing L to R, Matt Pierce, Reg Unterseher, Phill Hurley, Kirk Marcy, Ryan Smit, Andy Marshall, Seth McMullen, Max Mendez, Isaac Robbins and Justin Raffa. We spent 4 days in Mill Creek, Washington, working on our program for the 2014-15 season. We have 6 new pieces, including an a cappella version of John Phillip Sousa's "Stars and Stripes Forever" with a piccolo solo like you have never heard before. We sang the "National Anthem" at an Everett Aquasox baseball game. We also hit and then surpassed 1,000 likes on our Facebook Page. We have started receiving monthly donations from some of our fans. This money will be used to help us reach out to communities and schools that could not normally host a workshop, and are located too far away from some of our regular locations to participate. Thank you for helping us work with young men in these communities that otherwise might not ever experience singing in a men's choir. If you would like to help us with this project, please click on our "Donate" tab for more information. Members of M.E.N. were busy this past week at the Northwest American Choral Directors Association convention in Seattle, Washington. ﻿Dan Davison conducted the 7th-9th grade honor choir. Several of Dan's own compositions were performed by various ensembles through the week. Wallace Long directed the Willamette Singers on Jazz Night and then they did a workshop on Vocal Jazz with clinician Dave Cross. ﻿Kirk Marcy﻿ directed the first ever All Northwest Jazz Choir. Kirk had several arrangements performed by various groups. Andy Marshall has a piece performed by the 7th-9th grade honor choir. The piece was "Invictus", arranged for SSATB. M.E.N. performed the TTTBB version of this piece on our concert series this year. Isaac, Andy, Kirk and Dan did an impromptu performance of the men's arrangement for the youth choir during rehearsal. Isaac Robbins, our newest member, was the organizer for the 7th-9th grade honor choir. Max Mendez organized the high school men's choir. Reg Unterseher conducted an original piece, "The Tyger" with Chor Anno. His piece "The Steady Light" (also on the M.E.N. program this year) was performed by 3 different groups. Reg also had a few original compositions in the Male Chorus reading session. M.E.N. had excellent representation at the Washington Music Education Association conference in Yakima, Washington this past weekend. Reg Unterseher had pieces on the Friday PM choral concert. They were "Steady Light" in the SSAA version, and Jim-Along Josie on the Junior Youth Honor Choir concert , conducted by Judith Herrington. included a Vijay Singh piece. Vijay is also a former member. The Youth Mixed Choir, conducted by Gary Weidenaar, performed "Ritmo", composed by Dan Davison. Justin Raffa was awarded the "Friend of Music" award from the CBMEA. Congratulations to these current and former M.E.N. members for this recognition!